​The objective is to pull up alongside a parked car, then to reverse into a parking space keeping within two car lengths and givig due attention to other road users. Pull up into start position - about ½ metre or ½ a door length away from the parked car. 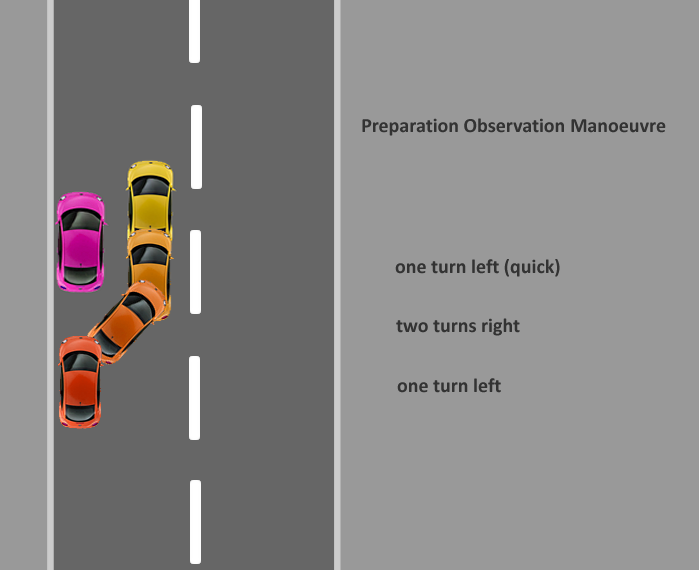 ​Manoeuvre - reverse until you reach your first point of turn and then stop. If clear - steer one complete turn of wheel quickly left. At second point of turn stop. If clear - steer two quick turns right. Keep car really slow using clutch control (remember camber of the road). Try to judge how close to kerb you at getting - if close steer quicker, if not close steer slower. Look out rear window to ensure it's still safe behind while reversing. ​As car gets parallel to kerb and straight in line with vehicle in front - one turn left. Then stop. Do any minor adjustments as required.